Description: Alexia is the daughter of a grey elf noble and a dryad. She retains all the beauty her mothers race is renown for (though she looks elven), and though she is very young at 24 (e.q. of 14 in human years). She is has matured fast, her long red hair hangs in satin waves down her back, and her amber eyes are like looking into pools of pure gold. She retains a innocent quality while having a curvaceous body the goddess of beauty would envy. Training on her fathers swords has toned her muscles. History and Personality: Alexia grew up in a small village in Symbayia, her mother is the local healer. She has her fathers desire to explore the world and is often seen with her companion Lynx (known as Kitty unless you ask him) prowling the woods around their village. Well known in town for both her uncanny beauty and who her mother is, and Kitty enjoys playing with the kids. 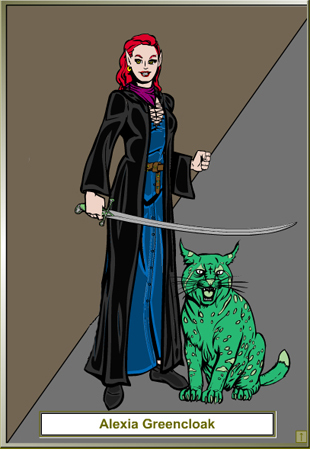 Kitty is as much Alexia's protector as friend and is fiercely loyal to the young girl. Recently Alexia went out with some others to help track and kill some goblin raiders. She saw what had happened to the poor families caught by the creatures and has a slight haunted look to her now. She seems to have given up her adventurous ways (much to her mothers relief) and has even been seeing a young handsome mercenary (who was smitten the first time he saw her) who has settled in the area. She fondly remembers her traveling companions and hopes to see them again.